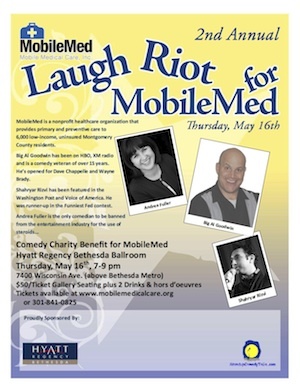 On Thursday May 16, I’ll be performing in the MobileMed 2nd Annual Fundraiser. Big Al Goodwin will be headlining and Andrea Fuller will be emceeing. It’ll be held at the Hyatt Regency hotel in Bethesda (at the same place of the usual standupcomedytogo’s saturday show). The tickets can be purchased at http://mobilemedicalcare.org.